You are currently browsing articles tagged plotting objects. Last night Felicity and I actually had an opportunity to share news of the Sense of Place project via an ‘old fashioned’ presentation, as opposed to virtually though our blog and other online media. It’s important to mention here that it was Greta who arranged this talk and had spent time planning it but was unfortunately unable to attend. We presented a summary of the project and progress made so far to the University of Reading’s Women’s Club. The Women’s Club was established in 1948 and membership is open to all women who have a connection with the University. The aim of the Club is to provide opportunities for social interaction, with particular emphasis on supporting those who are combining a career and family life and on welcoming newcomers and their families to the University. They hold various events throughout the year and have a range of interest visiting speakers, talking about a range of topics. Felicity and I were able to show some examples of the object record files that we have been using to enhance the database with and explain more about how reliant we are on the details which are recorded at the time of acquisition, as well as through research over the years. We then moved on to demonstrate the applications of our work on Historypin where we have begun to plot some of our collections, alongside photographs. As previously mentioned, we’ve focused on the area of Bucklebury initially so have therefore been able to make use of the ‘collection’ tool on Historypin, by pulling together some information about George Lailey. Have a look and you can try it out for yourself! The talk went well and it was really enjoyable to present our work to a non-museum audience and see that it really is of interest to those who may not be so familiar with accessing this kind of information through the internet and mobile devices. Apparently, many members of the Club were keen to get online and explore these developments for themselves. Success! The team welcomes our resident Historypinner! Anyone who has followed the Sense of Place blog since day 1 back in February will recall that I mentioned working with Historypin, a website which encourages communities to share images of their locality by ‘pinning’ them to virtual maps. I also explained that one of the aims of the Sense of Place project is to work with Historypin in finding a method of also pinning MERL object collection data onto these maps, to provide them with an enhanced geographical context. Although it appears that we have gone a little quiet on this front, we have been making steady progress behind the scenes and are pleased to announce that we now have our very own ‘History pinner in Residence,’ Rebekkah Abraham. Rebekkah is the Historypin Content Manager for We Are What We Do and currently has the pleasure of travelling out to Reading every so often to work alongside the Sense of Place team at MERL. We are very pleased to be working with her too. She is now busily working away on the technicalities of exporting data from our object cataloguing system, Adlib, through to Historypin, to ensure that information from the relevant fields is transferred successfully providing as much information as possible for the user. This will include the object name, a brief description and history, the maker and production date where applicable. These exports will mean that when updates or amendments are made to our records, they are automatically updated in Historypin. This project presents a new challenge for Rebekkah and Historypin as the website is currently only designed to upload photographs and their related information, which means some development is required. However, once this is achieved, there will hopefully be scope for many other museums from around the world to plot their collections geographically in a similar way. 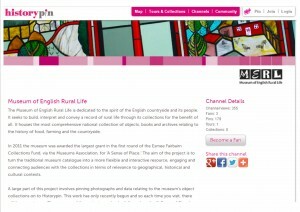 A visible development of this work is now available to explore in the form of a MERL Historypin ‘channel’ which holds everything from the MERL collections which has been uploaded so far. Do take a look as its far better to grasp what Historypin is capable of by trying it out, rather me rambling on about it in a blog post! For a number of reasons, which have been mentioned in several previous blog posts, the village of Bucklebury in Berkshire has been identified as an ideal location to begin plotting photographic and object content to on Historypin via this channel. This will then allow us to have a defined geographical area which we can try-out various Historypin functionality with. These could be tours, collections, stories and potentially a mobile phone app, which will highlight the rich collections that the museum is lucky to own, originating from Bucklebury. Bucklebury also has a thriving History Group and they now have their own channel too. This means that they can begin to upload the many images which they have collected over the years, making them more accessible to anyone who is interested. They already have some beautiful photographs from the 1953 Coronation celebrations which took place in the village. Of course, there are some problems for us to iron out. These things are never as straight forward as you might imagine. Many of the objects in the MERL collection have multiple places associated with them (where they are made, used, acquired etc) and representing this complex biography is one of the objectives of the project. We still need to work out how this will work in practice when they are plotted to a map, ensuring we do not end up confusing researchers and other interested parties further. Historypin also currently works by plotting photographs in a location and at a specific historic date. Many of the objects in the collection have no or very little information regarding the date they were made or used and it would be difficult to add this data to such a large selection of objects accurately, within the constraints of this project. Nevertheless, it feels exciting to be able to share some progress with you, which you can actually have a look at and explore further!